My primary computer has always been a deeply personal device for me — somewhat like smartphones are for most of us. It is always the device where I get real work done, create stuff, and even get to use a real keyboard, or two, considering the MIDI keyboard too. The first computer I had was a PC-XT clone with a fluorescent green monochrome display, running an older version of MS-DOS. The thrill of accidentally discovering QBASIC IDE on it (where I started programming) is what I still experience when I discover something new to do on Linux. Back to the topic, after owning a number of different computers (desktops, laptops, all-in-ones, even the now-extinct netbooks), a couple of years back I realized that I had never actually used a Mac. While I was not totally Apple agnostic, having used an iPhone and a number of iPad models, my exposure to OS X (now macOS) was almost non-existent. So after doing some online research, I settled on a one generation old 13" MacBook Pro with Retina display (Core i5, 512Gb SSD, 8G RAM) for around $1400. It was to replace an Acer ultrabook, running Ubuntu. The unboxing experience of the Mac had Apple’s elegance all over it, and I was instantly impressed by its beautiful finish. Initial setup of OS X was a breeze, as expected, even though when I tried to change the user name from the Bash terminal, I got my first taste of how OS X is not really like Linux or BSD. Doing it from the UI was not a problem though. I also installed Windows through Boot Camp, since my company was a Microsoft shop and I needed it for work. A year later, my experience with MacBook Pro and OS X was a mixed bag. On the positive side, it was a beautifully crafted machine. The trackpad on Mabrook Pro was the best I had ever used on any laptop. OS X was smooth and responsive (discounting the first few weeks with Yosemite). Boot Camp worked well, and my experience with Parallels and VMWare Fusion was decent (if not perfect). Having Garage Band was a bonus, especially with the huge sound libraries that come with it. And most of the software that I needed, including Microsoft Office, worked well on the Mac. Adobe CS was an overkill for me, so I went with the excellent Affinity apps for graphics design and photo editing. But then there were issues. Coming from a Linux background, not having a native package manager was frustrating. I tried Homebrew, which mostly worked, but packages broke sometimes. I fixed a couple of them, and submitted the fix, but it wasn’t ideal. Another issue was the lack of native virtualization solution, which both Windows (in Pro edition) and Linux distributions have. Parallels started nagging me to buy a new version after I upgraded the OS. B00t Camp kept causing problems on the partitions, and key mapping didn’t work well on Visio, which brings me to another issue (not Apple’s fault) — Visio and Project don’t have OS X versions. And then some of my older Line 6 music hardware and software didn’t work on OS X due to incompatibility. It works fine on Windows. Some open source software, like Inkscape also didn’t work well on OS X. I thought about triple-booting with Ubuntu, but I didn’t have enough disk space, and Ubuntu doesn’t work too well on a MacBook. So a year into the Mac, I started looking for an option that might be more suitable for me. I wanted a laptop with good portability, serviceability, good Linux support, great keyboard, long battery life, durability and heritage (which strengthens emotional connection with the machine). The search converged on Lenovo ThinkPad X260. The ThinkPad brand has a long history, dating back to the original IBM models, which are still used at the International Space Station. To fund the new machine, I sold my MacBook Pro on the Craigslist. It was picked up by a university student who had fried his last MacBook Pro by spilling coffee on it — a very Seattle thing to do! I purchased the ThinkPad directly from Lenovo, with Microsoft Alumni discount (which is substantial). The configuration that I chose maximized on almost everything except RAM and hard disk (for which I went with the most basic options). I picked the higher resolution Full HD display, and the extended battery. Then I ordered 1TB SSD and 16GB RAM from NewEgg. As soon as the laptop arrived, I installed the SSD and the RAM, and had an almost maxed out machine at $1100. I was surprised at how well Ubuntu 16.04 LTS and Windows 10 dual-boot setup worked on the ThinkPad. I was able to install both operating systems side-by-side with UEFI Secure Boot enabled. I did my usual customization of Ubuntu (long list, for another article), but in terms of hardware support, everything worked out of the box. Nothing says “business” better than the minimalist ThinkPad aesthetic with a matte display. The keyboard is fantastic, with great key travel and bounce. It feels even better than the keyboard on the MacBook Pro, but the trackpad on the Mac is nicer. The battery life is phenomenal — it consistently runs for more than 12 hours on a single charge. There are two batteries — internal and external. The external battery can be hot-swapped, which is nice to have. And there are a lot of ports for connecting external devices. In short, I am thoroughly enjoying my computing experience on the ThinkPad with Ubuntu, and after seeing the controversial new MacBook Pro, I don’t regret making the switch. 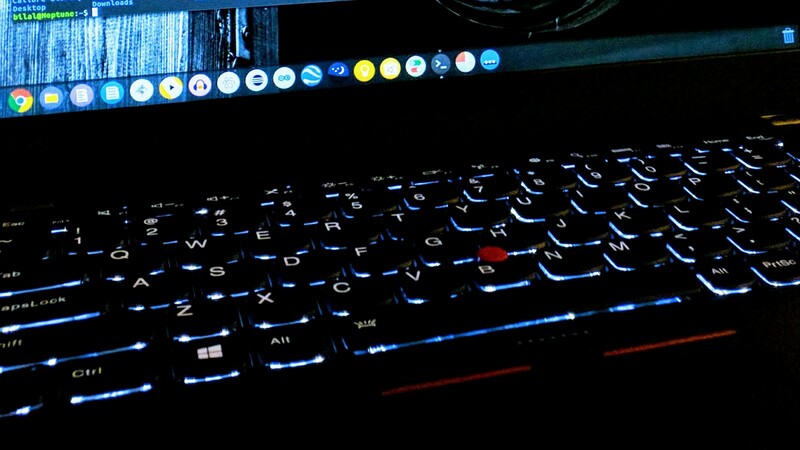 I still miss that Mac trackpad and the glowing Apple logo sometimes, but for desktop Linux users looking for a solid modern laptop, I would highly recommend considering a ThinkPad.